Would you read a romance comic book? If you’re shaking your head, you might want to reconsider. Nebraska native Janelle Asselin recently launched Fresh Romance, a monthly digital romance comic magazine, and these are not your typical love stories. Despite being quite busy with launching the magazine and doing the convention circuit, she was able to take some time out to answer a few questions we had about the magazine, her life and what it’s like being a woman in the comic book business. Asselin launched the site from Los Angeles, California, where she currently resides with her two, sometimes more, cats and her husband, Paul. Reader: When and why did you decide to start an online romance comic magazine? Asselin: Well, I’ve known for a while that I wanted to start my own comics publishing company, after working in the industry for years. It seemed like the best way to put out the kind of comics I wanted to make without worrying about what a bunch of corporate managers thought would work. After a lot of research into different kinds of comics I was interested in, I settled on making romance comics, and Rosy Press and Fresh Romance were born! Romance comics seemed like the best way to reach out to people who weren’t already reading comics with a genre that hadn’t existed in comics for a while. Reader: Where did you find the contributors? Asselin: Some of them I knew through mutual friends or just from being active in the comics community, like all three of the initial writers–Sarah Vaughn, Kate Leth and Sarah Kuhn. Others I knew from compiling a list of creators for my column Hire This Woman on ComicsAlliance.com. And some I knew from doing targeted research for specific kinds of creators–for instance, for Sarah Vaughn’s Regency romance, we needed an artist with a really strong attention to detail who would care about historical accuracy, and Sarah Winifred Searle is that person. But it took some hunting! Reader: What was the most challenging obstacle in getting things going? Asselin: Money! [laughs] If money weren’t an issue, I would’ve launched a long time ago. Unfortunately, I care about paying people, so I needed a fair amount of money to get things going. I invested some of my own money, and our Kickstarter campaign rounded out a good amount to get us launched. Reader: How do you think the launch went? Is there anything you would have done differently? Asselin: I think it went really well! The Kickstarter was a resounding success, and once everyone got their comics, the response was wonderful. The fascinating thing I’ve noticed is that no one story is the favorite amongst readers and reviewers – all three stories have their fans! That’s really wonderful. In terms of what I might’ve done differently, well, ideally we would’ve had a little more work done before the Kickstarter went live just to provide more of a cushion for each issue. But starting up took a lot of work! The other big thing is that I wouldn’t have launched the Kickstarter right before two big comic conventions, as I thought that would be good for outreach and instead it was a huge energy drain for me! Reader: What has been your favorite comic to edit? Asselin: I can’t claim a favorite of the Fresh Romance stories! It’d be like choosing a favorite child! So I’ll point to an older comic I edited Knight & Squire by Paul Cornell and Jimmy Broxton. Knight & Squire are characters owned by DC Comics that are sort of the British Batman and Robin. We did a 6-issue miniseries with them that was both fun and thoughtful–I heard a lot of people were particularly pleased with the last issue and how it took what seemed like a handful of fun but a little silly adventures and made them complex and a little sad. Plus, it was fun to work with a couple British creators on a very British book–I had to have some references and sayings explained to me because they aren’t common at all in the U.S.! Reader: You have worked for several comic book publishers. What was your favorite job and why? Asselin: On this one I can definitely say it’s being the Publisher of Rosy Press. This is a dream come true for me. I love editing comics, I love working with talented creators, I love finding new voices, I love planning, I love thinking about the comics business, and I get to do all of those things with Rosy Press. I worked places like DC Comics and Disney and while they both have their charms (not the least of which were the benefits! ), it can be hard to make really creative comics in an environment where a company owns the characters and has a vested interest in making sure that they are still marketable and usable on merchandise and whatnot. Plus, everything is very segmented into departments, and I like to do a little of everything! It’s the perfect job for some folks, and many of those folks are my friends! But it wasn’t quite right for me. 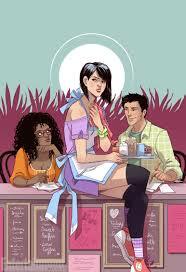 I’m happy to be where I am now – freelancing, writing, and working on Fresh Romance. Reader: What was your favorite comic growing up? Do you have one now? Asselin: I LOVED anything X-Men when I was a kid. The ’90s X-Men cartoon made a huge impression on me! My sister worked at Pizza Hut and they were giving away comics based on the X-Men cartoon and she brought some home for me. It was an exciting moment for me. My favorite comic now is harder because I read so many! I’m a big fan of Saga, Lumberjanes, The Infinite Loop, Giant Days… I could go on and on! I also adore the Hilda series by Luke Pearson. Totally charming comics for kids. Reader: At what age did you become aware of the lack of female representation in comics and comic book production? Asselin: It wasn’t really until I started getting involved in the community when I was like 20 that I found out I was an “oddity” (which I was, back then). I was active on a message board where there were only three other women, and then I’d go to conventions and people would stare at me. It was definitely weird, because up until that point, I’d just been another fan enjoying the comics and I didn’t know that I was “weird” because I was a woman. I started paying attention more and more to the names in the credits in the comics I was reading, and how women characters were treated. I wanted to identify with the characters but more than anything, I wanted to feel included – like it was okay that I was just another woman enjoying comics. Eventually, I met some women who were working in comics and I started seeing more and more women at conventions. I started to feel that even though we weren’t the majority, there were lots of us in the industry. That’s when I really became committed to the idea of supporting other women in comics and speaking about representation. Reader: Do you think women are getting more recognition and representation in the comic book world? Asselin: Absolutely! It’s an everyday struggle, unfortunately, because things like this are never easy. But it’s been fantastic to see more and more women lauded for their work in comics and more and more female characters represented well. But even better is that I think comics publishers and creators are starting to understand the idea that “women” are not a single entity–the concerns and attitudes of one woman are not the same as the next woman. This means that we’re seeing increasing numbers of comics that show diverse women as both creators and characters. And that is really amazing. I think it’s only going to get better! Reader: What would you most like to see change? Asselin: One thing that has been a little harder than some of the other changes is getting women in management positions at comics publishers. Most comics publishers have a fair number of women in manager level or below jobs, but you don’t see a ton of women running publishing companies or acting as editor-in-chief. Of course, this isn’t just a comics problem, but rather a problem most businesses have. I’d love to see more women supported to become not just another cog in the publishing wheel, but to lead. I think that will bring on even greater change in the comics industry. Reader: We just had O Comic Con here in Omaha. What do you think about the growing number of comic conventions? Asselin: I think it’s great–and frankly a little overwhelming! I can’t imagine what young Janelle would’ve thought about being able to go to a comic convention in Omaha, but I’m pretty sure I would’ve begged my parents to take me. It can be a full time job to keep track of the different conventions around not just the United States, but around the world! I generally attend anywhere from 2-5 conventions a year, and would like to attend more, but the cost to attend so many can be prohibitive. That’s why it’s actually really nice that there are so many conventions, because that means there are more local conventions that people don’t have to spend a ton of money to travel to. And even better, that means they can take some of the money they saved on travel and spend it on comics! Reader: Also, I have to ask, what are your cats’ names? Asselin: [laughs] Monkey and Skittles are our permanent cats. We also recently fostered two kittens named Lilly and James and now have three foster kittens named Mork, Mindy, and Alf. Volunteering and fostering with a local shelter is one of the ways I stay sane while I’m working from home!